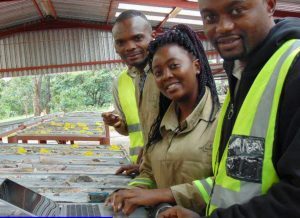 DEMOCRATIC REPUBLIC OF CONGO – Vancouver-based Ivanhoe Mines has a new resource estimate for its high grade Kakula copper discovery 25 km west of Kolwezi. Using a 3% copper cut-off, the company says the indicated resource has grown by 50% to 174 million tonnes grading 5.62% copper. There is also an inferred resource of 9 million tonnes at 3.66% copper. The Kakula strike length now extends to 13.3 km and remains open in multiple directions, says Ivanhoe. The combined Kamoa-Kakula indicated resources is 1.03 billion tonnes at 3.17% copper for 72 billion lb. of copper. The inferred resource for both deposits is 183 million tonnes grading 2.31% copper. A 1% cut-off was used for this estimate. The Kamoa-Kakula project is a joint venture of Ivanhoe, Zijin Mining, and the DRC government. Learn more at www.IvanhoeMines.com.